Mémoires is a most personal diary. It helps you keep memories of your days and gives nice ways of remembering something happened years or months ago. First of all, Mémoires can do a lot by itself. Mémoires keeps track of your calendar, your photos, places you visit, your physical activity. You can accommodate this information with your notes about each day. With the great features comes great responsibility. App does not share this data with any servers, or third parties. This data stays on your iPhone and Mémoires just presents it to you in a nice friendly manner. Just to make it clear – Mémoires keeps your diary only on your iPhone. Your data is not shared with author of the app or with any third parties. Mémoires does not gather any data, statistics or anything like that. No your personal data ever leaves this application. Mémoires integrates with Health app to display your health and workout information. Mémoires uses really personal information and only you own it and decide how to deal with it. Mémoires supports Siri for adding notes and also has Siri Shortcuts to mark current day as good one. Also, you can ask Siri what happened today or on this day in past years. 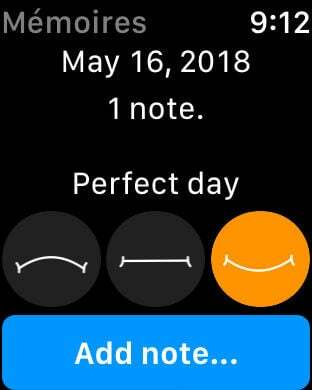 There is an Apple Watch app that will help quickly add notes by dictating them. Do you like Dark mode in other apps? Mémoires has it too. And it will use «Dark mode» when you enable «smart inverse» in accessibility settings. Your notes can have formatting and even images. At the end of the month or year you’ll get some summary on what’s happened. Sure! Give it a try. It is free. No ads. No data collection.